On our third and final day in New Orleans, we mounted our bikes and rode downtown instead of walking. As you are probably aware, New Orleans is extremely flat, and this fact made biking on a warm spring day a pure pleasure. 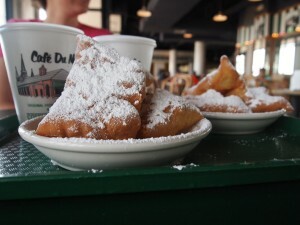 To help fill our calorie deficit caused from riding a whole 12 miles, we lunched on the famous beignets and cafe au lait from Cafe de Monde. You might think that beignets are just square donuts, and while that is certainly true, fresh donuts are quite tasty and pair well with the bitter chicory coffee. Whenever visitors think of New Orleans Creole food they typically think of French Creole fusion, but New Orleans also has a rich Italian heritage as well. 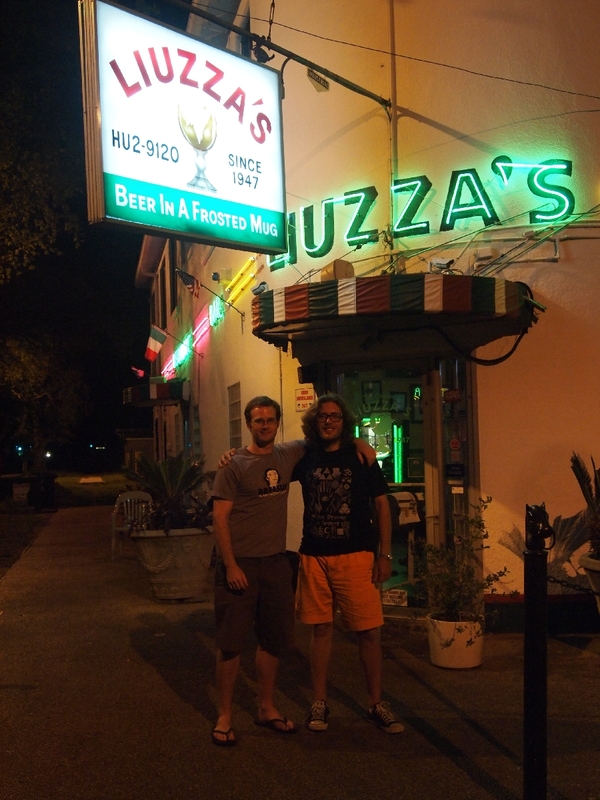 Sicilian immigrants to New Orleans worked with local ingredients to create now classic dishes featuring shellfish, creamy garlic sauces, eggplant, and “red gravy.” In pursuit of this culinary tradition our friend took us to Liuzza’s for dinner. Liuzza’s is a cozy neighborhood restaurant with abundant pescetarian options, but the vegetarian selection is rather limited. However, we’re used to enjoying delicious traditional foods in establishments that might not consider their cuisine compatible with our diet. We started with a stuffed artichoke and then shared a plate of pasta alfredo. The stuffed artichoke was rich and savory and the pasta was swimming in a fresh homemade alfredo sauce of cheese, cream, butter, and garlic – delicious! To cap our healthy day off, we went to what was the real gem of the day – Angelo Brocato’s Ice Cream Shop in Midtown. Angelo Brocato’s prepares fresh Italian baked pastries and rich ice cream desserts like spumoni and tortoni. Taylor tried her first ever cannoli and the three of us split a tortoni, which is an almond-flavored frozen soufflee (see here). While Midtown is not on most tourist’s path, this bakery is well worth the trip.